Of Discs: 1 disc(s) Studio / Label: Capitol UK Release Date: 23 Mar 1998. Disc 1 11 The Unbeliever 8.10 mins. Disc 1 10 2 A.m. 5.38 mins. Disc 1 9 The Edge of Darkness 6.39 mins. Disc 1 8 Blood On The World's Hands 5.58 mins. 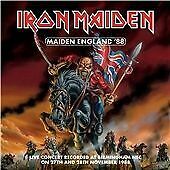 Iron Maiden A Real LIVE One CD UK EMI 1993. Condition is Very Good. Dispatched with Royal Mail 2nd Class Large Letter. Iron Maiden ‎– The Book Of Souls Deluxe Digibook with Slipcase 2 x CD Metal Rock. Condition is Very Good. Dispatched with Royal Mail 2nd Class Large Letter. Iron Maiden From Fear To Eternity Double CD Album. Condition is Very Good. Dispatched with Royal Mail 2nd Class Large Letter. Iron Maiden "Somewhere back in time" 1980-1989 CD album. Condition is Very Good. Dispatched with Royal Mail 2nd Class Large Letter. Iron Maiden - Somewhere Back In Time: The Very Best Of 1980-1989 (2008). Condition is Very Good. Dispatched with Royal Mail 2nd Class Large Letter. Iron Maiden - Killers Enhanced CD. Condition is Like New. Dispatched with Royal Mail 2nd Class Large Letter. For sale - The 'The Reincarnation of Benjamin Breeg' by Iron Maiden as an original UK release CD single. This was bought by myself from new in 2006 and has been played just once to prove it out. It is in superb condition and has always been kept out of light to avoid fading. Iron Maiden-Edward The Great,The Greatest Hits,2002 cd....Tracks;run to the hills/the number of the beast/flight of icarus/the trooper/2 minutes to midnight/wasted years/can i play with madness/the evil that men do/the clairvoant/infinite dreams/holy smoke/bring your daughter to the slaughter/man on the edge/funeral/the wicker man/fear of the dark/(live at rock in rio....... Condition is Very Good. A Matter of Life and Death. Title:A Matter of Life and Death. Your item will be previously owned but still in great condition. The disc will play perfectly without interruption and the case, inlay notes and sleeve may show limited signs of wear. Somewhere In Time (CD 2002). Condition is Very Good. Dispatched with Royal Mail 1st Class Large Letter. For sale - 'Run to the Hills' by Iron Maiden as an original UK re-release CD single. This was bought by myself from new in 2002 and has been played just once to prove it out. It is in superb condition and has always been kept out of light to avoid fading. Artist: Iron Maiden. Format: CD. For sale - 'Run to the Hills, Live' by Iron Maiden as an original UK release CD single. This was bought by myself from new in 2002 and has been played just once to prove it out. It is in superb condition and has always been kept out of light to avoid fading. Artist: Iron Maiden. Album: Best of the Beast. Format: CD. STUDIO RECORDING FROM 1998. THE SECOND ALBUM FROM BLAZE BAYLEY'S ERA. MINOR SCUFFS ON THE CASE ETC FROM THE LAST YEARS OF USE, BUT STILL IN VERY GOOD CONDITION. Iron Maiden - From Fear To Eternity , The Best Of 1990-2010 (2XCD) 2011. The Best Of 1990-2010 (2XCD) 2011. Iron Maiden - From Fear To Eternity. 1-12 Fear Of The Dark Written-By – Harris 7:51. 1-1 The Wicker Man Written-By – Smith , Dickinson , Harris 4:36. 1-6 Man On The Edge Written-By – Bayley , Gers 4:33. IRON MAIDEN. THE NUMBER OF THE BEAST. CASE, BOOKLET & DISC ALL LIKE NEW. STUDIO RECORDING FROM 1983. 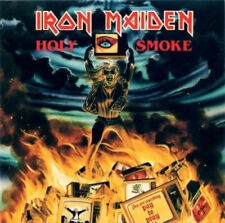 ONE OF THE BEST IRON MAIDEN ALBUMS EVER RECORDED. MINOR SCUFFS ON THE CASE ETC FROM THE LAST YEARS OF USE, BUT STILL IN VERY GOOD CONDITION. Iron Maiden The Number Of The Beast. 8 Track CD Album 1982. EMI 7 46364 2. Released in 1982 on EMI Records, Cat No CDP 7 46364 2. Front piece is a fold out information booklet. Iron Maiden- Edward The Great - Greatest Hits - CD -. CD, CASE AND BOOKLET IN GOOD CONDITION. IRON MAIDEN - THE NUMBER OF THE BEAST CD - 1998. The Fugitive. Weekend Warrior. This great CD was released on EMI in 1998 ( 0724349692503 ). Be Quick Or Be Dead. The CD and artwork are in near Mint Condition. Childhood's End. Fear Is The Key. Chains Of Misery. Iron Maiden Best Of The Beast CD Album. Condition is Very Good. Dispatched with Royal Mail 2nd Class Letter. IRON MAIDEN - RUN TO THE HILLS / THE NUMBER OF THE BEAST. THE NUMBER OF THE BEAST. RUN TO THE HILLS. FROM THE "THE FIRST TEN YEARS" SINGLES CD REISSUES SERIES. IRON MAIDEN - SELF TITLED. IRON MAIDEN. CASE, BOOKLET & DISC ALL LIKE NEW. Somewhere In Time (CD 2002). Condition is Very Good. Dispatched with Royal Mail 2ND Class Large Letter. IRON MAIDEN. “ BE QUICK OR BE DEAD “. IRON MAIDEN.THE WICKER MAN.CD SINGLE. THE WICKER MAN. THE WICKER MAN.VIDEO. MAN ON THE EDGE. Sign Of The Cross. Lord Of The Flies. Man On The Edge. Look For The Truth. Blood On The Worlds Hands. IRON MAIDEN " THE X FACTOR" CD NEW!!!!!! !